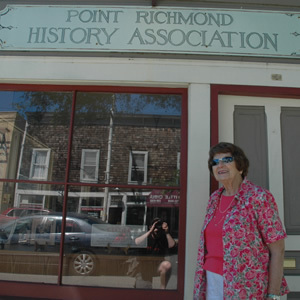 This entry was posted in neighbors and tagged air corp, army, Bob Dornan, community, Dornan Drive, Ferry Point Tunnel, Germany, history, history association, infantry, Ireland, letters, Point Richmond, Richmond, Scouts, servicemen, stanford, supportive, The Point, World War II by Noah. Bookmark the permalink. Beautiful and touching recollection. Thank you, Mid. Thanks for sharing, Noah……I’ve loved all seven!! This is my favorite postcard thus far! I didn’t expect the change of tone, and at the same time I found it very touching. This piece provides further evidence that you’re speaking to real people from the point. It was a pleasure to hear Mid tell her own story, and I look forward to hearing more. How touching! This is a wonderful discovery since moving to Point Richmond several months ago. What a lovely idea to present these audio postcards! I hope to hear more. Mid’s story is a sweet one.